Official Release: Sunshine and blue skies, yes; showers and hailstones, no thank you. That is why surfers tune in to the coastal weather report, hang-gliders check the internet and hikers invoke the weather gods. But what about BMW drivers? With immediate effect, they can turn to an on-board precipitation radar. After all, not everything that comes from on high is a blessing, as not only open-top enthusiasts know. Heavy hailstorms and large hailstones, for example, can wreak major damage – not just to your car. It pays, then, to be prepared for the weather well ahead of time so as to plan accordingly. BMW is the first car manufacturer in the world to offer its customers the option of calling up graphics inside the car that show the current precipitation for any location in Germany. Available as from now, the graphic displays feature two zoom settings, are updated every 15 minutes and show the geographical distribution of rain, hail or snow. 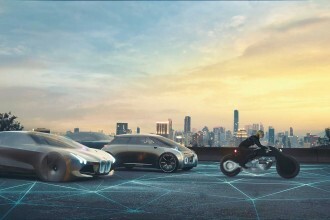 The precipitation radar, a service offered by BMW ConnectedDrive, is a further development of the weather forecast that is already available in the car. By contrast with the high-resolution precipitation graphics, this gives information on current and forecast weather conditions at the present location and the destination, as well as any selected locality in Europe. From July 2009, drivers will also be able to call up a “Precipitation Pattern” menu option that provides an animated representation of cloud movements over the last 90 minutes. BF Analysis: Look for this to be in the German market for the first year or so before being rolling out to other markets. I love this idea! There have been many times I wish I could see the live weather in the car; granted the iPhone has several apps that make this easy enough.